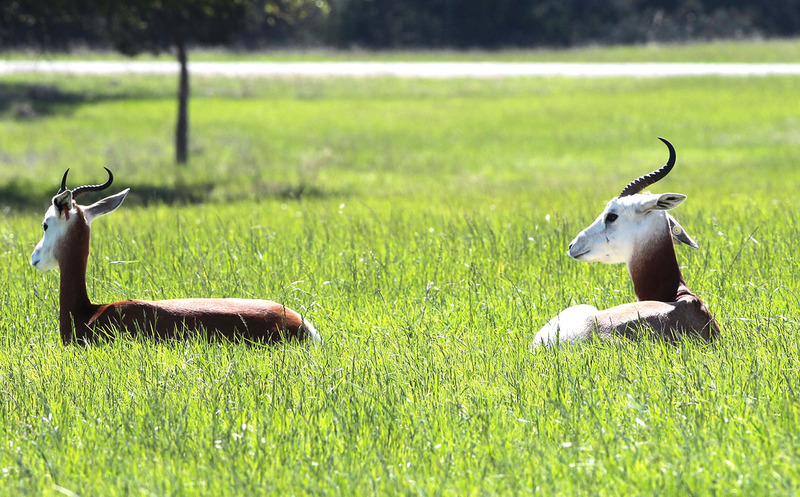 As a guest in your own vehicle, the second pasture you drive through at Fossil Rim Wildlife Center is the Buffer Pasture. In the past, you may have seen some emus and whizzed right through to the third pasture, but there is a lot to see in this pasture for those with some patience and a keen eye. 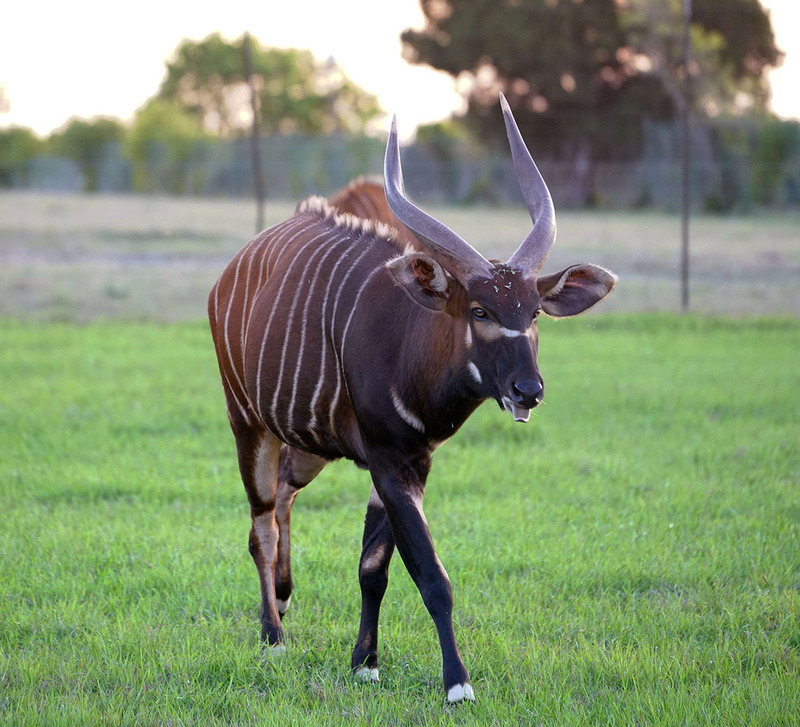 The two largest animal species in the Buffer Pasture, mountain bongo and greater kudu set the tone for the pasture and are able to interact with minimal conflict. It is only 20 acres among the 1,800 at Fossil Rim, so – to the benefit of some shy species – the road through the Buffer Pasture was moved from the right corner over to the center of the pasture. Guided tour vehicles can still utilize the former route if there are animals in that area. Beyond emus, the pasture also includes greater kudu and a pair of critically endangered species – dama gazelle and mountain bongo. 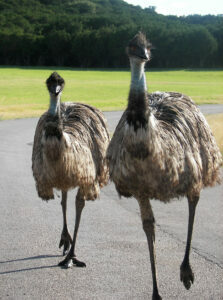 Emus are the lone animal species in the Buffer Pasture that guests can expect to approach their vehicle. Becca McLachlan, animal care specialist – hoofstock, talked about what is in the best interest of the animals. “The new route for guests through the middle of the pasture has definitely made life less stressful for these animals, especially now that the route doesn’t go right by the alfalfa feeders,” she said. “That’s especially true for our female kudu, who is very flighty. She is eight years old and just now okay with us driving past her after we’ve fed pellets. You can still see these animals, and we are inching their feed troughs a little closer out to the middle near the road. Among the antelopes in the Buffer Pasture, dama gazelle are most likely to be seen out in the open – especially in the middle of the day. McLachlan talked about how having a sharp eye can make the pasture much more enjoyable. “I feel like this pasture gets passed up a lot because you have to really look for the animals, but it has some of my favorite species,” she said. 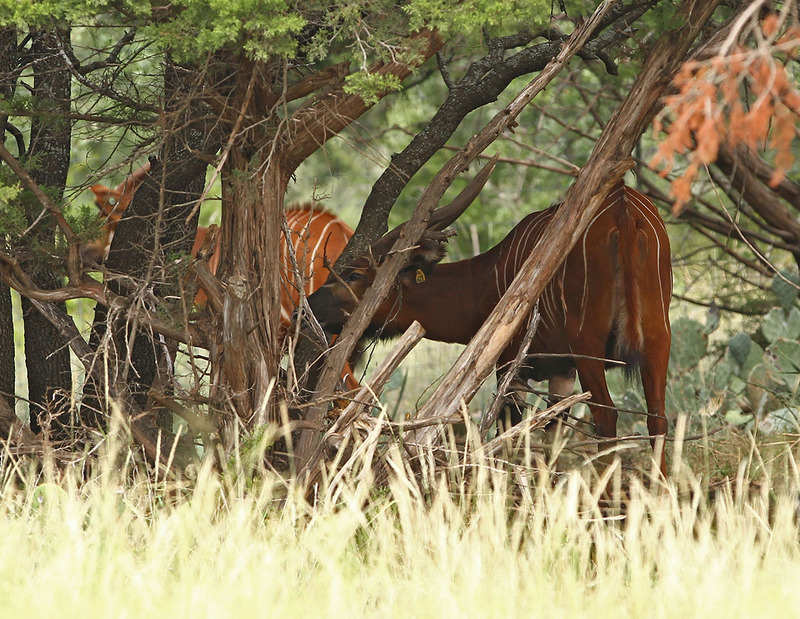 “A lot of times, they are back in that tree area behind the alfalfa feeders – especially the bongo, since they are a forest antelope. They do make a midday trip to the water trough along the fence line with Main Pasture. 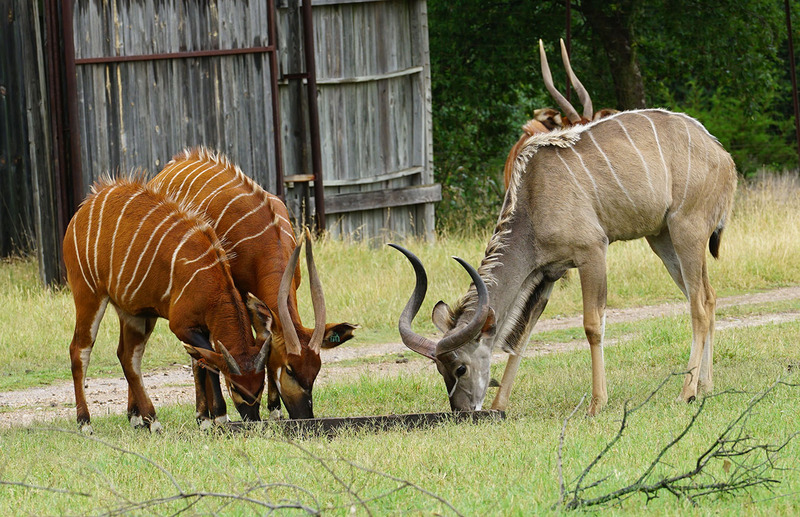 Mountain bongo (top) and greater kudu both feel more comfortable among the trees, or at least near them. Guests are always encouraged to visit in the morning due to the summer heat, but for those who do arrive on a sunny afternoon, McLachlan talked about what she generally sees from the Buffer Pasture residents. 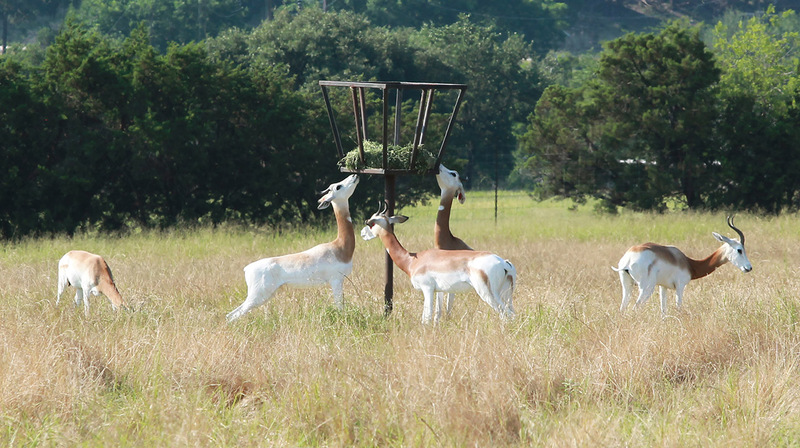 “Chuck” the dama gazelle bull (right) is easily identified by his one horn. He is a curious character who enjoys checking out animals in the adjacent pastures. “If you are coming through here on a hot, sunny day, the bongo are the hardest species to see,” she said. “If it’s hot, they’ll be in those trees other than that water trip. 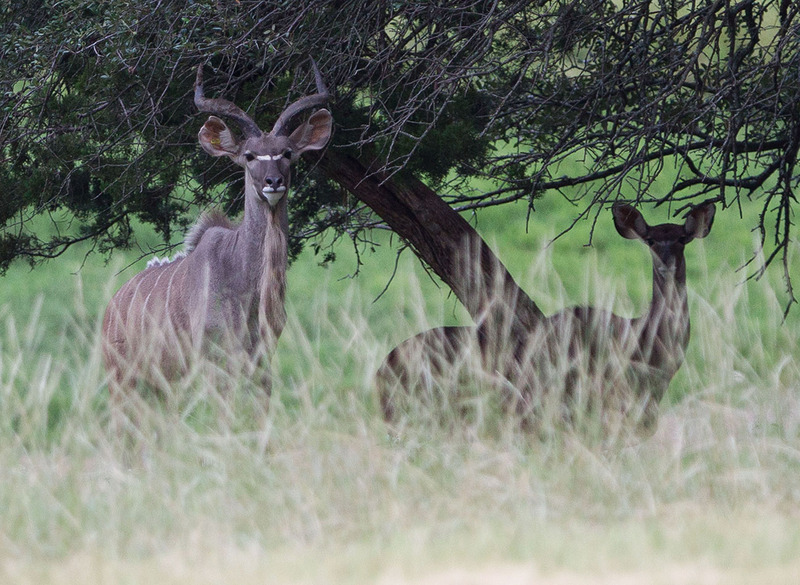 When the kudu leave the trees, they sometimes head down toward a different tree clump by the pond, and then you can get a good view of them while you are still in the Front Pasture, if you know when to look that direction. 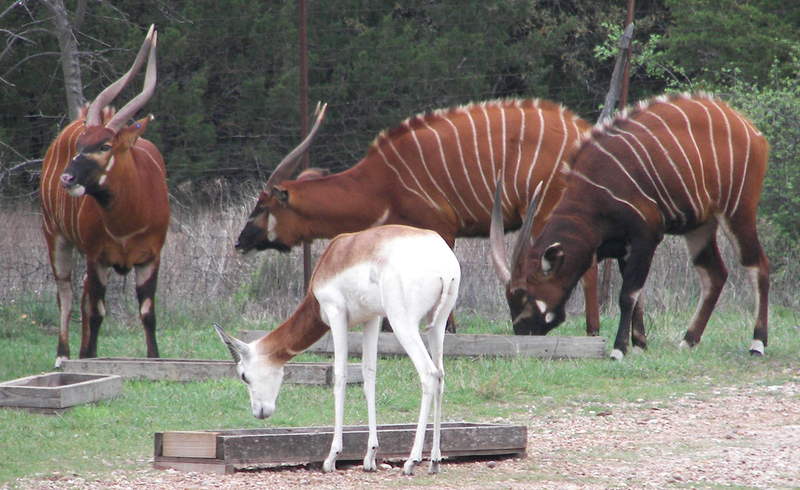 The best times to observe mountain bongo are in the morning when Fossil Rim opens, or in the evening on a specialty tour. On the other hand, if you arrive when Fossil Rim opens at 8:30 a.m., you have a great chance of seeing all the Buffer Pasture species out in the open, before the sun takes its toll. Even though the dama gazelle are the smallest antelopes in the Buffer Pasture by far, they are not bullied by the other residents. 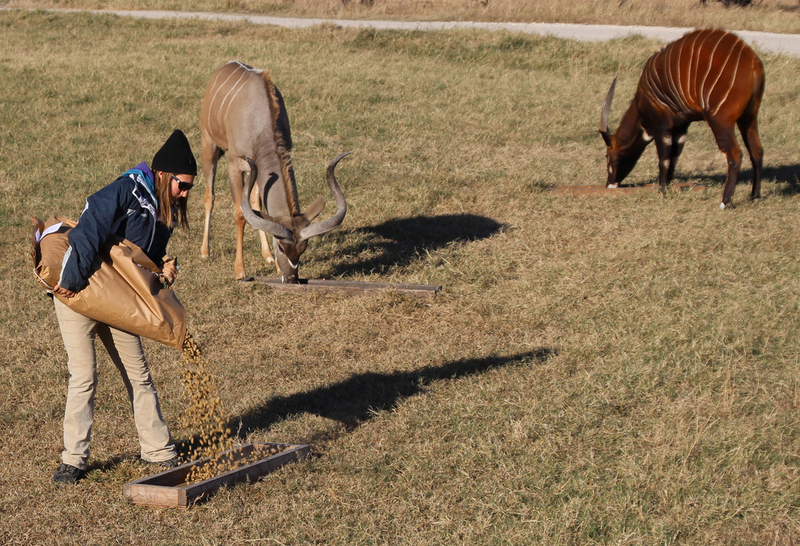 When you see morning pellet feedings in the Main Pasture, it is not out of the ordinary for sable or gemsbok to aggressively run other antelope or deer off if they get too close. As McLachlan explains, the etiquette in the Buffer Pasture is a bit different. “The Buffer Pasture is by far our most polite pasture, I think,” she said. “They are all so tolerant of each other’s space. I put the pellets out (on a recent) morning in two sets of troughs, and ‘Chuck’ the dama gazelle bull was the only animal there waiting for pellets. He was at the first trough and started eating. Becca McLachlan wants guests to take their time going through the Buffer Pasture and enjoy the animal species that live there as much as she does. “They walked right around him and let him be. I’ve seen a kudu male and a female dama licking off the same salt block at the same time, sharing and each taking a side. McLachlan also pointed out some interaction she sees along the boundaries of the Buffer Pasture. “When it comes to activity along the fence lines with the other pastures, sometimes I see the emus checking out the ostriches,” she said. “Both seem interested in what the other birds are getting for food. Usually, the ostriches are being fed first by guests (in the Front Pasture), and the emus are waiting right there. Chuck pretty routinely walks the fence line with Main Pasture. The next time you enter the Buffer Pasture, instead of cruising through quickly, hang around for a bit and observe these distinctive antelope species. And count on some of our avian Australian natives to roll out the welcome wagon.